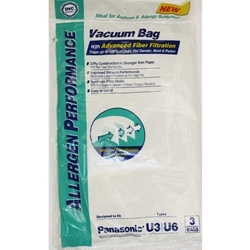 Anti Allergen Panasonic Upright Vacuum Bags. DVC Micro-Filtration Panasonic Type U, U-3, U-6 and U-12 Upright Vacuum Cleaner Bags comes 3 in a Package. These are the thick cloth like bags that do not burst like paper bags. These vacuum bags are ideal for those who suffer from dust-related or allergic discomforts. With 99.7% Filtration, DVC vacuum bags trap microscopic particles and allergens making these bags great for allergy sufferers!